In the same way, you can nest as many namespaces inside of other namespaces as you judge necessary. To make programming in C# a little easier, many classes ship with it and they are created in various namespaces of the .NET Framework. Each namespace in C# is used to provide a specific set of classes. The most regularly used namespace in the C# language is called System. Inside of the System namespace is a class called Console. The Console class is used to display things on the console screen also called the DOS window. Besides the Write() method, the Console class also provides another static method named WriteLine(). The difference is that, after displaying something on the screen, the Write() method keeps the caret on the same line but WriteLine() transfers the caret to the next line. We will see various examples of this behavior throughout our lessons. We saw that, to call an object or a method that is part of a namespace, you must “qualify” that method or object using the period operator. Instead of using this approach, if you already know the name of a namespace that exists or has been created in another file, you can use a special keyword to indicate that you are using a namespace that is defined somewhere. This is done with the using keyword. To do this, on top of the file (preferably), type using followed by the name of the namespace. Because the regular names of data types we introduced in the previous lessons are more known and familiar, we will mostly use them. Because the data types are defined as classes, they are equipped with methods. One of the methods that each one of them has is called ToString. As its name implies, it is used to convert a value to a string. In Lesson 1, we saw that, to see the result of an application, you must execute it. To make this possible,, Microsoft Visual C# ships with an internal program called a compiler. A compiler is a computer program made of internal other sub-programs. One of the sub-programs, in fact probably the first, of a compiler is called a parser. A parser “scans” a file that contains (part of) the program. It checks for syntax, keywords, unknown words, and some other routines. If the parser finds a problem, which could be anything, either it stops or it continues making a list of the mistakes it found. Then it displays this list to you to fix. Sometimes it would point to the exact line where the/a problem was found. Sometimes it would point to the line where the problem showed its impact although the problem may be found somewhere else. With experience, you will know how to fix the programs or troubleshoot these problems. In this ebook, we will address as many issues as possible. If the parser doesn’t find any problem, or after you have fixed the problems, it (the parser) passes its result(s) to the compiler. The compiler calls another program called a linker. If the program contains just one file, the linker considers it. If the program contains more than one file, the linker considers them. The linker gathers some of the files that the C# compiler shipped with (those files that your program needs in order to work, since your program doesn’t need all possible files that C# ships with), puts them together (“links” them) with your file(s) to get your instructions in a manner that can produce a suitable result. If there is no significant problem, the compiler creates the program. This doesn’t mean that everything is alright, it only means that the compiler thinks that everything is alright: it is still possible that the result may not be what you would expect. To make your life easier, all of the sub-programs (parser, linker, debugger, etc) that ship with C# are grouped in one large program: the compiler. Therefore, from now on, we will use the word “compiler” to refer to the program you use to “translate” your English-based instructions into a computer-based language. The compiler that ships with the C# version we will use, that is, the compiler of the Microsoft .NET Framework is a program called csc. Like most other programs, it has the extension .exe. This csc name is not standard. This means that another C# compiler may have another name; csc.exe is just the name of the compiler we will use. The csc compiler is freely available if you download the .NET Framework from the Microsoft web site. The FileName factor is one we are familiar with. 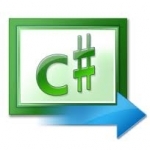 When C# was invented, one of its biggest goals was to avoid some of the difficulties of C/C++. Among them was the use of pointers. C/C++ uses pointers to refer to the area in memory where a value is located. C# highly avoids pointers and takes over memory management as opposed to letting the programmer take care of that aspect of an application. You can still use pointers in C# in extreme cases when you judge them necessary. The + button allows you to expand a hidden code section. This behavior of creating + and – buttons is part of the Code Editor of Microsoft Visual Studio (yes, many other programming environments use that behavior also). To create these sections, the Code Editor follows some rules. For example, it looks for the start and end of such items as directives, namespaces, classes, methods, etc. We mentioned that you didn’t have to type anything on the right side of #endregion and you could leave it empty. In our example, notice that there is a rectangle with gray lines around the string that follows #region. This rectangle doesn’t cover the string that follows #endregion. This means that if you don’t type anything on the right side of #endregion, that section on the right side the #region line would not show.